Wonderful Appliqué Quilt in Stunning Colors! Estate Auctions Inc. is pleased to announce a rare opportunity to own one of the finest quilts they have handle in nearly 15 years of selling on eBay. A wonderful appliqué quilt in stunning colors that is simply amazing. It consists of four large blocks (measuring approx 30.5 by 32.5) with appliqué designs on each block and a stunning border. The design is a stylized vase with flowers, and leaves and cherries. A Pennsylvania Dutch look. The cherries are actually little red balls sewn onto the quilt, coming from the branches with chain stitched embroidered stems. The colors are bold, blue-green, red and gold on a white background. All of the fabrics are solids, no prints or calicos. There is some printing visible on the back which suggests flour sacks may have been used for the backing piece. "When we saw this quilt for the first time we were amazed. Someone took a great deal of care in preserving this masterpiece and now we have been graciously allowed to put it on eBay, wow," says Norb Novocin, Owner of Estate Auctions Inc. of Delaware. The quilting is quite heavy and hand done. 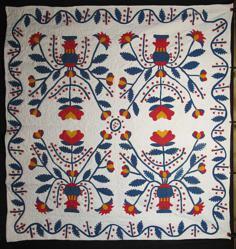 There are designs incorporated into the quilting, mostly floral motifs. On the back one can read "LONG CLOTH" "SPECIAL FINISH" backwards. Also seen is an "X" and an "A" and mystery letters to the right. Those words were used on Feedsack cloth in the late 1800's and VERY early 1900's. This auction closes Monday, August 6th at approximately 10:00 PM EST. Interest in this rare quilt continues to increase as the closing draws near. Nearly 70 pictures of the quilt can be seen at EstateAuctionsInc on eBay and a video can be found on YouTube which has many detailed close up views.